Graham McKenzie loves the gentle pace of life in Martin County. In a nutshell: In the heart of what is known as Florida's Treasure Coast - named after the countless shipwreck treasure found along this stretch of the Atlantic - Martin County has fabulous beaches, wildlife and climate but without the large crowds and traffic you get in other parts of the Sunshine State. It's community tourism at its best with a strong focus on keeping it homegrown. You, as a visitor, can live, for a short while, within the society whilst ensuring that the benefits are kept within the local economy. Why your clients should go: Martin County is the ultimate in a chill-out holiday. Nowhere within the destination is too far to drive, walk or cycle, and there are no hills. If you want to combine a laidback stay with something more frenetic, Orlando is just 2 hours's drive to the north and Miami is just over 90 minutes to the south. It suits almost any type of visitor that's looking for a 'real' american experience or indeed a wind down, something less manufactured. What to see and do: Golf, kayaking, surfing, shopping, beaches, it's all here and more. Sadly I only had three days so I started at the Elliot Museum, dedicated to inventor and publisher Sterling Elliot. Sterling owned a cycling magazine and invented an individual addressing machine way before computers, but his big-ticket idea was when he worked out the issues of the unequal turning of the front wheels of a vehicle and invented the steering knuckle, or 'kingpin' that would become a critical element in the success of the automobile. The museum details all of this and it has a collection of cars that is the best I have ever seen outside of Dearborn, Michigan, the home of Ford. Next on the list was the trip into the eco world of the Stuart waterways with an operator called Riding the Waves. Basically, you sit on what looks like a floating go kart and explore the mangroves. After 10 minutes' tuition I was off and away. In my 90-minute trip I had the privilege of watching dolphins play within an arm's reach, spotted ospreys and golden eagles and, to top it all off, a giant iguana sunbathing in the branches. Fantastic! On my last morning I took a 2-mile stroll along the banks of the St Lucie waterway to a small cafe and satisfied my desire for local breakfasts while spotting more birdlife, flora and fauna. After breakfast, taken outside by a firepit, I walked back into Stuart town centre to experience the farmers' market which also featured a live band playing blue grass. The smell of the locally baked goods and fresh coffee was almost enough for me to have elevenses, but I resisted. What to eat and drink: There are hundreds of options in the area but the epi centre is around downtown Stuart. On the first evening I ate outside on a simple wooden table at Noodle World Thai & Sushi and enjoyed an excellent chicken stir fry with cashews and two beers. The next night I went to locally-owned favourite the Gafford and had excellent pan roasted locally-caught Blue Corn Crusted Snapper with blackened gulf shrimp, tequila lime butter, and corn salsa over wild grains plus local vegetables. The atmosphere is friendly and lively. Daily specials are available and on some evenings, in keeping with the back room vibe and decor, live folk and country music is played. Where to stay: I struck gold in Stuart as I was allocated a small house to myself and it happened to be the oldest house in the town. Owned by the very comfortable but modestly priced, Old Colorado Inn (formerly the Coventry Hotel), I stayed in the Lyons House which was first in many things. The first house in Stuart, it was built in 1890, was the first school, had the first wedding, first birth and was home to Ernest Lyons who wrote American Classics 'The Last Cracker Barrel' and 'My Florida'. He lived in the home from 1937 until his death in 1990. The property benefits from access to a pool and garden, has a small kitchen, is a matter of yards away from the boardwalk and breakfast is left hanging on the door handle every morning. Rooms at the hotel start at £169 per night. 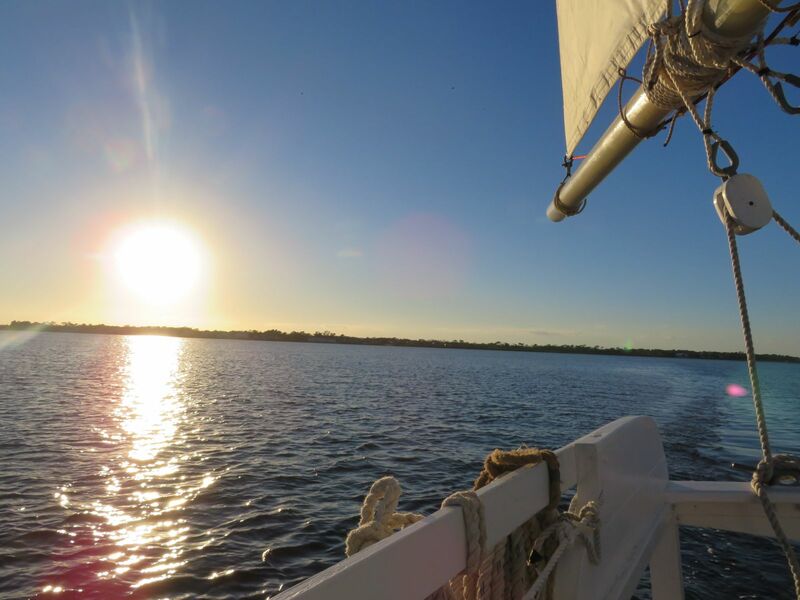 Don't miss: An evening cruise on the Schooner Lilly. It's worth $40 of anybody's money to take this two-hour trip on the area's best known wooden sailing vessel, captained by the very informative owner Fred. As you can imagine, cloudy days are not that numerous in Martin County so most of the cruises offer sunset scenes that would rival many in the world. Mix into this your 'bring your own' selection of drink (yes adult beverages are allowed) and food, a range of wildlife, plus a cruise with just the whistle of the wind in the sails, and you have the perfect evening. Top Tip: Just after sunset on any day, but preferably on a Friday or Saturday night, go to a bar or cafe in the main streets of Stuart, pull up a chair at an outside table, order your refreshment of choice and just watch the world go by. Graham's trip was organised by Discover Martin and his car was supplied by Dollar Car Rental as part of the Florida Huddle Convention organised by Visit Florida.